Born in Yorkton, Manitoba, Colleen graduated from St. Basil high school in 1976, receiving a trophy for her singing. Living independently since the age of 16, Colleen worked for 28 years at McDonalds. 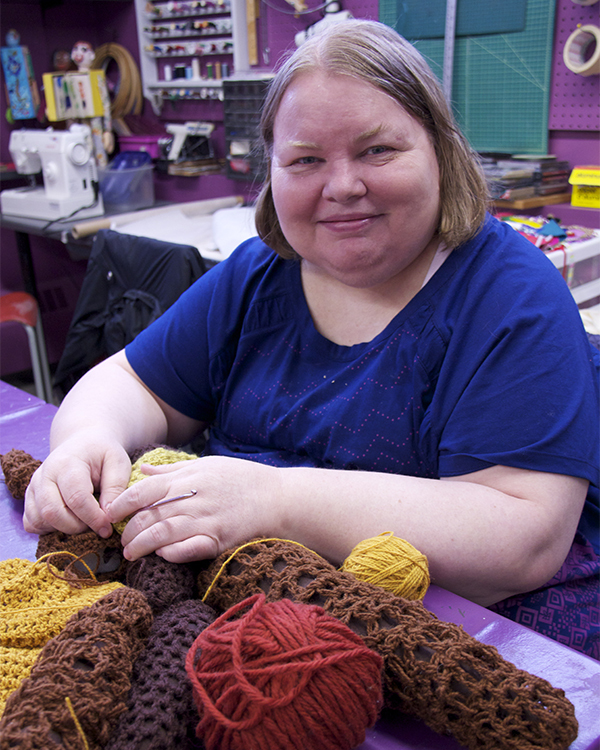 She learned to knit at a young age and has always liked making things and drawing. With a desire to learn how to do more, Colleen joined the Nina on the advice of a friend. She has been experimenting ever since, her skills and creativity clearly evident in everything she does. She has crocheted unique sculptural forms, embroidered abstracts, and developed her own process of layering colours in painting. She is excited about her artistic development.